“The Children of Lir” is an Irish legend that tells an enchanting story about a king of Ireland and his beloved children. The story itself is very simple and easy to follow. Long ago there was a king in Ireland called Lir. He had four beautiful children, a son, a daughter and twin sons. Their mother died and King Lir wanted them to have a new mother. So it came to pass that he married his wife’s sister, Aoife (Oifa). Then suddenly Aoife became jealous of the King’s children because she saw their great happiness with the King. So she decided to get rid of the children. On a beautiful summer day she took the children out to a lake for a swim. As soon as the children went into the water, she cast a spell on them turning them into swans. She herself was taken away by a dark cloud from the North and was never seen again. But King Lir was in deep grief because of what had happened to his children. However, Aoife’s spell had not taken away the children’s human voices and they were to be set free from the spell in 900 years time when St. Patrick would come to Ireland and they would hear the sound of the first Christian bells. For 900 years the swans experienced great hardships but it never kept them from singing with their beautiful voices. People came from far to see the swans who could talk and sing. 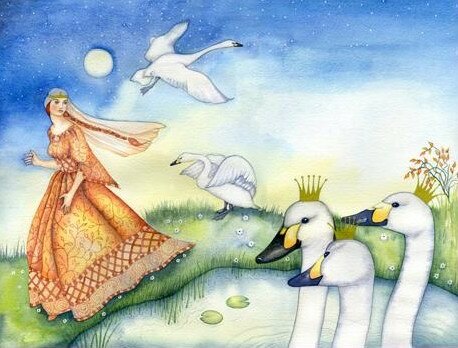 Then one day, when 900 hundred years had passed, some people came and laid their hands on the birds to steal them but the swans became humans again, although 900 years old. They were quickly baptized and their souls were taken straight up to heaven. They were the children of Lir. The earliest myths about new stone-age. Contemporary “myths” which deal with science being a delusion and merely a fragment of what we know. Myths with Indo-European warriors and a main sky god involved. The 6th century myths when Ireland was christianized. “The Children of Lir” belongs to the third layer of myths. It takes place at the time when St. Patrick first comes to Ireland to christianize it. In this myth both pagan kings and Christian priests act side by side. Just as the children of Lir were set free from Aoife’s spell when the sound of the first Christian bells reached them, the same way Christianity is believed to have brought freedom to Ireland and St. Patrick is the Patron Saint of Ireland till this day. “The Children of Lir” is in many ways a very typical Irish myth. Besides the fact that it tells a story of the Irish history, it has not lost its meaning even today because it is still alive in place names and tells about things which are also true today. Human emotions such as love and hatred, happiness and unhappiness, jealousy and generosity concern both the past and the contemporary times. This is the reason why this myth has also got a moral in it that the reader can link to even today. What the moral of this myth is, is of course for every reader to decide but the way I see it, one of the things it seems to tell us is that you should not give ground to selfish desires at the expense of somebody else’s happiness. ← Can flea farts change the temperature of the dog? I am amazed there are not more reviews in here….please if anyone has other views or points to bring out about the post please share as i am fascinated in the subject…..